BJP's manifesto titled 'Sankalpit Bhatar Sashakt Bharat' was not been prepared with a 'tukde tukde' mindset but with a strong nationalist vision, claimed Arun Jaitley. 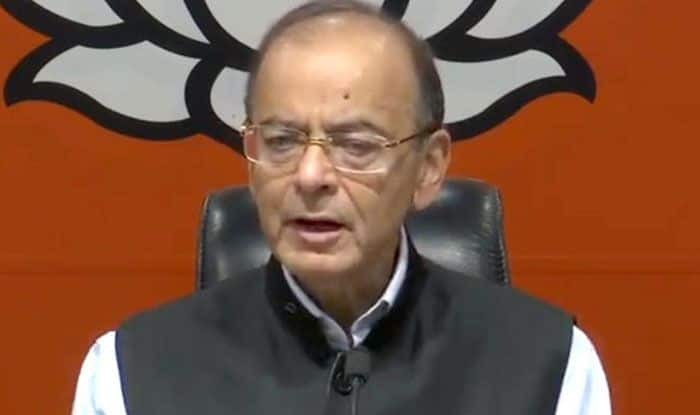 New Delhi: BJP leader Arun Jaitley on Monday said that the BJP manifesto was not been prepared with a ‘tukde tukde’ mindset but with a strong nationalist vision. The BJP released its election manifesto for the upcoming elections at the party headquarters in the national capital. The ‘Sankalpit Bharat Sashakt Bharat’ encompasses 75 poll promises and focuses on overall development of the nation. The Union finance minister said the party was committed to annulling Article 35 A of the Constitution, which provides special rights and privileges to the people of Jammu and Kashmir. The provision is discriminatory against non-permanent residents of Jammu and Kashmir, he added. “When India is at the cusp of history-making most of all its lost opportunities, does it require a fragile government or a decisive one,” asked Jailtley. Jaitley added that previous governments only gave slogans, but the Modi-led administration gave resources to the poor. He said the essence of the BJP manifesto is to deplete poverty over the next five years to single digit and then gradually eliminate it. “Our fiscal prudence since 1947 has been best ever for any government,” the finance minister said.